To repair damaged stonework, begin by identifying the reasons for decay. Then select a method repair, without omitting the alternative of doing nothing. More cosmetic work is covered under maintenance. You must understand why the stonework is deteriorating. The usual reasons are excessive moisture, poor previous repairs, and finally natural decay. Damage to soft stone is usually caused by water. Check for leaks in the roof, gutters and downpipes. Try to find out where the water is getting in. A second major reason for damage is inappropriate previous repairs. Hard cement pointing and repair mortars are very damaging to soft stone. Lime mortar or mortar with little cement is flexible, very porous and lets a building breathe. Hard cement mortar traps moisture and salts right below the pointing and creates problems. You can do little to prevent the natural decay of softer stone; the only options are to leave it or to attempt a repair. Much old stone is unnecessarily replaced when it could easily be repaired, or even left untreated. Good examples are where some spalling or flaking has occurred where iron reinforcements have corroded or where the erosion of the matrix in a cast stone has left a rough surface of exposed aggregate. Consider replacement for exposed and severely deteriorated features, such as hand railings, roof balustrades, or wall copings. Use patching for small areas of damage, or just leave them alone. Where the surface of a sedimentary or cast stone has separated from the core layers, a grout can be injected to fix it. Ideally, use a cementitious grout, but hairline cracks may require the use of resin adhesives. Use a low-viscosity epoxy, applying it through small injection holes, which are themselves filled afterwards. Use a lime mortar for holes, damaged corners, and minor spalls. More major damage requires the advice of a consultant to determine the cause of deterioration and to specify necessary repairs or replacement, as appropriate. To match the damaged stone, use a mix of lime, sand, crushed stone and fine grit. This may be further coloured with white, 'light', or grey Portland cement or inorganic alkali-resistant masonry pigment. Where rusting ironwork has caused the damage, remove the loose stone and treat the ironwork or else replace it with stainless steel fittings. Where spalls have a feather edge, cut back the repair area to a uniform depth of 1.5cm. Use an adhesive to help bond the patching, or else use small nylon or stainless steel rods. This is a destructive process; you will remove good stone to achieve an even surface. With this approach, you take away some delaminated material and retool the surface to make it resemble the original finish. This requires specialist skills and is therefore expensive. This is often not possible with cast stone as it will expose the aggregate core. Either replace the entire block or take out part and do a Dutchman repair. The first problem is finding a matching stone. As with retooling, you will need the services of an expert mason. And again, this is irreversible. With a Dutchman repair, the damaged stone is cut out, with either straight or keyed sides. A piece of new stone is then prepared to fit into the slot. You can simply remove loose pieces of stone. You may then patch the area; crush the old stone and use it in the patching mortar. Patching can be effective, be affordable and can be reversible so that it can be redone in the future. By careful patching you can stop moisture entering the stone and causing further damage. 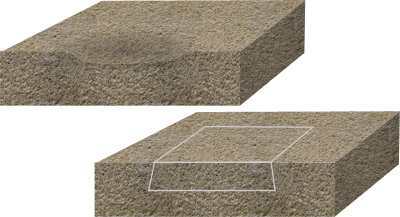 The patching material you use must match the colour and texture of the existing stone. It must adhere well, be breathable, it must have similar thermal expansion characteristics, and it must weather well. Keep patching as minimal as possible. Avoid feather edges and thin repairs; cut, with a grinder rather than a chisel, the areas where the repair is going to be done to deepen them and create square or undercut edges. You will find it difficult to match the original stone. Instead use a variety of mixes for patching; in this way the errors will be more subtle. Err on the side of too dark rather than too light. The surface texture is critical; try to match the roughness in the original stone. Plastic repairs will always have a limited life, and should always be designed to be sacrificial to the host masonry. Appropriately specified lime based mortars with binder, a coloured aggregate and, if necessary, natural (not synthetic) colour pigment should be suitable. Natural pigmentation will not fade like modern synthetic pigments.